To join a local HOG chapter, one must first join National HOG. Full membership for the bike owner: $45 for one year, $85 for two years or $120 for 3 years. See the Harley-Davidson website for further information -- www.harley-davidson.com. Associate membership for non-riding spouse: $25 for one year, $45 for two years and $65 for three years. Associate women can join Ladies of Harley (free) at the same time as registering for Associate membership, or she can do it later via the HD website or call a toll free number. Once one has their National HOG card, one can join a local HOG chapter for $25 a year (no distinction between full or associate member). Full payment through 3/31, one-half payment from 4/1 - 4/30, pro-rated after 5/1. 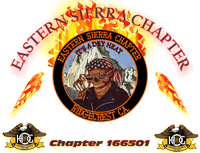 Our local HOG club Membership Officer or Secretary must see the National HOG card at the time of registration with our local chapter to verify National membership.